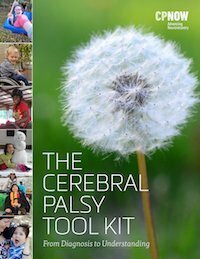 This list is intended to offer you some of the highlights of reading material, movies, and other media available on the topic of cerebral palsy. This is by no means an exhaustive list. If you are interested in finding out about more sources of information the Christopher and Dana Reeve Foundation website includes a very extensive reading and media list under the “paralysis resource center”, and the book “Children with Cerebral Palsy” has a an excellent list of resources as well. For information about current research and general news articles see the “CP Research/News” section of the site. 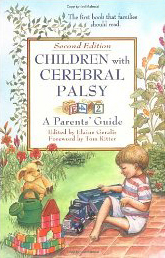 Children with Cerebral Palsy: A Parent’s Guide by Elaine Geralis: This is a fantastic, reliable resource and a great “first book” to have by your side. It is easy to quickly access reliable information. 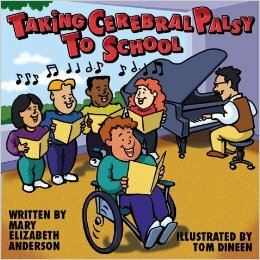 The book is edited by a mother of a child with cerebral palsy and is written in cooperation with several experts who focus on their particular topic. 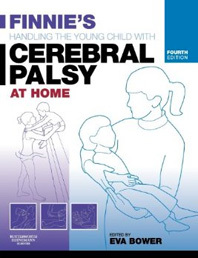 Finnie’s Handling the Young Child with Cerebral Palsy: In reviewing this book I found myself overwhelmed by the detailed information and textbook presentation of the material. Maya’s grandmother came across it and thought it was wonderful. She suggested I approach it as a reference guide rather than trying to read it cover to cover. After I took this approach (and was more patient) I saw that it offers some of the most valuable information and insightful reminders about caring for a child with CP that I have ever seen in print or even heard someone say. I also would rely upon my child’s physical therapist and/or occupational therapist to assist me in determining which patterns of movement in the book correlate with my child’s situation. Many of the “handling” and positioning diagrams may be difficult to understand and integrate unless you already have been shown the positions illustrated. Lastly, the book assumes access to equipment (particularly home-related adaptations) that many of us do not and will not have access to because they are typically not covered items by insurance. Overall, this is a stellar resource but do take your time with it, and ask for help from a professional if you have difficulty with the material presented. 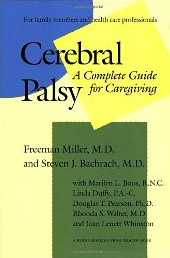 Cerebral Palsy: A Complete Guide for Caregiving by Freeman Miller and Steven J. Bachrach: This is another excellent resource guide. Whereas Finnie’s book focuses mostly on hand to hand caregiving, this resource focuses more on learning about your child with CP and how it specifically may affect him/her. Again since this is another very in-depth guide I suggest referring to it when you have specific questions rather than sitting down and reading it cover to cover. The formatting can be a bit confusing at first so be sure to read the preface (something I almost never do but in this case I really needed to). One thing this guide offers that I find helpful is a small guide to typical developmental patterns. This is helpful for offering some guidance not only in signaling that your child may need assistance at different stages, but also as a way of offering reassurance about misconceptions or misunderstandings you may have had about your child’s development that may be typical. It also breaks down information by age, specific diagnosis within the realm of CP (i.e hemiplegia, spastic diplegia etc.) and medical problems associated with CP. It tackles some large topics very well including navigating health care, the legal and educational systems and being an adult with CP. The very end of the book includes a CP encyclopedia. I really appreciate the unique approach this book takes which is to further define CP by illustrating how it can be confused with other problems, diagnoses, and symptoms. At the same time I caution people who look to this book to help them diagnose or make their own determinations about their child since you may be drawing inaccurate conclusions and causing yourself needless anxiety. 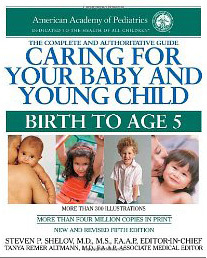 Caring For Your Baby and Young Child by Steven Shelov: This book is put together by the American Academy of Pediatrics. We have used it as a general care-giving resource and guidebook. It was not created with the special needs child in mind but it does offer solid, informative information about caring for children from birth to age 5. It offers guidance regarding typical developmental milestones, finding care-givers, child safety, handling common childhood emergencies and more. 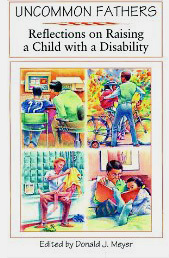 They do include a small chapter on developmental disabilities which contains a section on cerebral palsy. 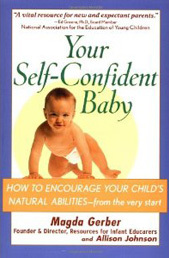 Your Self-Confident Baby by Magda Gerber and Allison Johnson Although not directed to parents of special needs children, this book is nonetheless important because it teaches parents how they can support the development of a calm, confident, and authentic child, a child in touch with her feelings and accepting of herself. The author emphasizes important concepts which form the foundation of these values. They include parents taking care of themselves, becoming a keen and sensitive observer of your child, creating consistency, and respecting your child’s unique development and nature (for more information about their method and philosophy, see their foundation at www.rie.org). A common pitfall for special needs parents is to view our children as helpless or incapable. We often fall into the thinking that our children suffer enough so we want to minimize their struggles whenever possible: a natural and understandable feeling. Despite the limitations our children may have, it is important to allow them the opportunity to explore their independence (whenever possible) and begin to incrementally master tasks they are capable of doing. Over time, these opportunities build confidence which is ultimately the message the author intends to convey. However, the book itself only devotes a small section to special needs children (beginning on page 104, and each parent will need to figure out how to adapt the approach to the needs of their child. This section needs more detail to successfully explore the complicated special needs parent/child dynamics. The authors assume an almost seemless transition in applying the method to special needs children. Their tone and lack of detail treats it as so. I think that is a mistake: it’t not that simple. Since the method relies upon the child’s independence, one of my initial questions was how do I responsibly employ this “hands off” method and ensure my child’s self-confidence if her body cannot keep pace with her mind? How do I strike a balance so that my child is not too bored, too frustrated, or too dependent? These are murky waters, and they present a very big challenge for special needs parents. Nonetheless, the book is still important and worthwhile. The author’s emphasis on being a keen observer of your child will help you “read” your child and determine what challenges are appropriate and which leave them needlessly frustrated. Successfully mastering this issue is a key component to helping our children develop healthy self-confidence and maximize their independence. Until someone write a similar book directed at special needs parents and caregivers, this one remains important, in spite of its limitations. Here is a video taken by a parent using the REI method with her 6-month infant. It’s counter intuitive to how most of us approach being with babies and children but offers some profound wisdom. Uncommon Fathers: Reflections on Raising a Child with a Disability by Donald J. Meyer These are honest, heartfelt essays from fathers of children with disabilities including CP, Autism, and Down’s Syndrome. As a father of a child with CP, I identified with many of the essays and found a silent affirmation of some of the feelings I have had about my daughter and her disability. These fathers discuss pride, shame, regret, love, and dedication through their experiences. Other fathers will find an emotion or essay that resonates with them and gives them comfort, and for that reason, this book is a must read for fathers of children with disabilities. 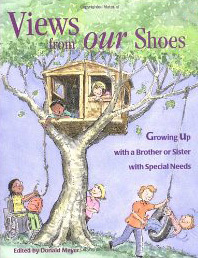 Views from Our Shoes: Growing Up with a Brother or Sister with Special Needs by Donald J. Meyer: This is a unique and fantastic collection of essays written by siblings who are growing up with a special needs brother or sister. It offers an unusual window into the often overlooked dynamic among siblings in family’s that have a special needs child. The essays are heartwarming, candid, and inspiring. I commend the editor who brings attention and comfort to these children and who also coordinated the book by and for father’s listed above. 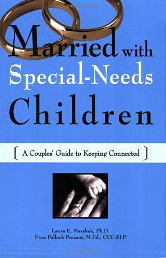 Married with Special-Needs Children: A Couples’ Guide to Keeping Connected by Laura Marshak and Fran Prezant: In this resource you will find relevant, candid and relatable information. I highly recommend this book and the sooner a partner or couple reads it the better. You will save yourself lot of grief and stress, and strengthen your marriage, by being aware of the common pitfalls and dynamics that may emerge when you have a special needs child. Rolling Along: The Story of Taylor and His Wheelchair : Taylor is a young boy (and twin) with cerebral palsy who is transitioning to using a wheelchair. This small book is very informative and offers genuine insight into this little boys’ feelings. 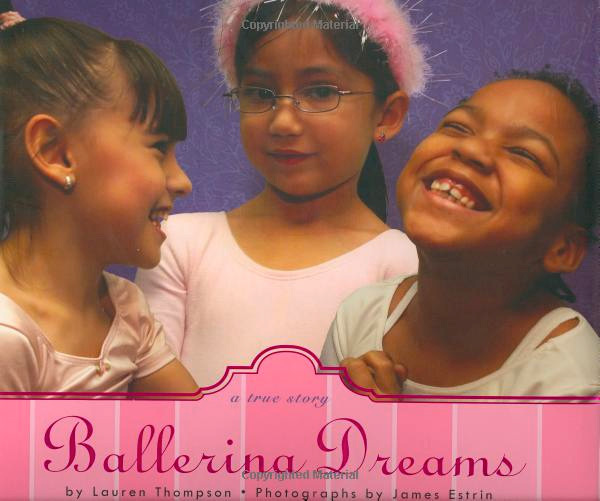 Ballerina Dreams by Lauren Thompson: A true story about five little girls with cerebral palsy and other physical disabilities who wanted to be ballerinas and dance onstage like other girls they knew. Thanks to the kind heart and open mind of a local physical therapist, these girls were able to participate in a special ballet class and recital. This is a wonderful children’s book and one of the first about cerebral palsy that really grabbed my daughter’s attention. It is positive, fun, and inspiring. 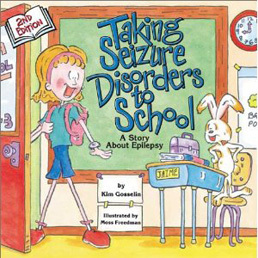 Taking Seizures Disorders to School by Kim Gosselin: This is a wonderful children’s book (probably elementary school age) that clearly and simply explains what seizures are and dispels myths about the people who have them. It is upbeat and informative. I think adults could benefit from reading it as well. Mommy I Feel Funny! 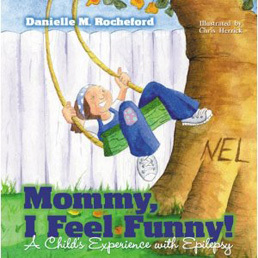 A Child’s Experience with Epilepsy by Danielle Rocheford and Chris Herrick: Written by an adult who grew up with epilepsy herself, this book is a great source of connection and hope for young children with epilepsy. It is bound to make your child feel less alone. 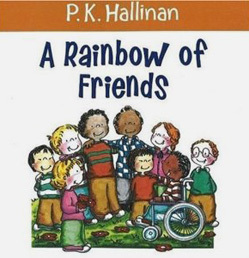 A Rainbow of Friends by P.K. Hallinan: This is a wonderful little book for young children. I especially appreciate how it articulates the obvious and more subtle differences among children. I plan to give this to my child’s school teacher for their collection. 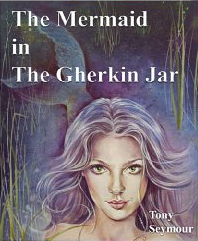 The Mermaid in The Gerhkin Jar: I loved this children’s book (ages 7-11). It’s a fun and imaginative read that offers wisdom, healing and disability education for everyone in the form of an imaginative story. The author has cerebral palsy and wanted to write an adventurous tale featuring a main character who has CP as well. Christopher, the main character attends school for the first time and realizes how different he is.from other children. He befriends a mermaid with a disability of her own. Their relationship redefines them both. Rarely, does one find main characters with disabilities in books for kids and especially in a well told story. I wish the author the best of success with this book. I look forward to seeing it begin to fill a gap in children’s literature where characters with special needs become the main focus and are presented in capable and relatable ways. Available currently on Kindle and Kindle applications only (you may be able to download a Kindle application for free on certain devices if you follow the instructions on the author’s website). 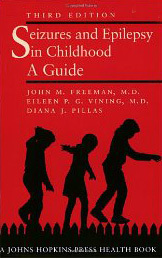 Seizures and Epilepsy in Childhood A Guide by Freeman MD, Vining MD, and Pillas: Fantastic! How could I possibly be so enthusiastic about a book on this topic? It is empowering, smart, and I would even say a bible for those parents needing guidance about seizures. It is easy to read and access information but also offers great detail for those readers who desire it. 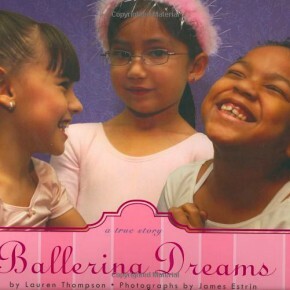 I emerged wiser and calmer about my daughter’s condition after reading this book. Bravo to this team of authors! 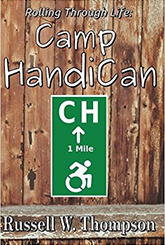 Rolling Through Life: Camp Handican: This is a humorous look at life through the perspective of a wheelchair user. J. Alan Wayne’s life changes from that of a quiet bachelor to a married life dedicated to working with teens with disabilities. 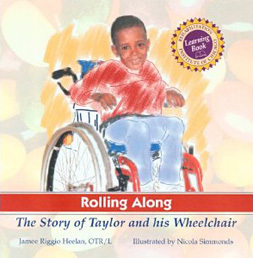 The author of this book is Russell Thompson who has CP and has been restricted to a wheelchair for the last ten years. You can follow his blog at http://www.paraabled.com. The Brain That Changes Itself by Norman Doidge: This is a fantastic, hopeful,and fascinating resource! 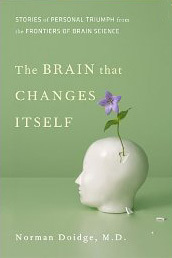 Itconfronts the long-standing beliefs about the brain being stagnant and inflexible. According to researchers this is proving (and has been proven for decades) to be anything but true. In the last decade the concept of neuroplasticity has gained momentum in the scientific community. Scientists are developing new ways of helping brain-injured children and adults recover lost functions. This book is interesting in its own right and applicable to improving the health and well-being of all people beyond just the special needs communities. 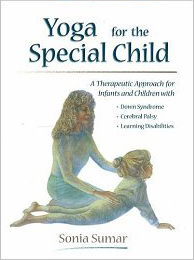 Yoga for the Special Child by Sonia Sumar: I heard about this book from Uncommon Voyage which is also included in our reading list. It offers a history on Ms. Sumar’s personal experience in using yoga with her daughter who had Down syndrome. She includes several case studies and testimonials about children with special needs and their families who she has worked with at her center. I appreciate the humility and care Ms. Sumar took in putting this resource together so that it is easily understood and relatable. There is good information and descriptions detailing how you may start a home program with your child. I think it would be helpful for the parent or person who wishes to pursue a home-based program to at least take a series of introductory yoga classes. There a few contraindications listed for beginning a home program. In those cases she states that it is imperative to consult with an experienced practitioner since there are some yoga poses which may exacerbate certain conditions. Uncommon Voyage: Follow one mother’s journey to help her child by using alternative therapies and treatments. This is an extraordinary window into what it can be like to find your own voice as your child’s advocate. This is especially difficult when parents are facing less known and/or unchartered territory. I value this work for the information it offers about the broad range of effective treatments parents do not typically hear about for CP. I also appreciate the honesty with which it is written. I think it makes it easier for other parents to express their own insecurities, fears, and challenges when they hear a powerful parent being candid about her own. Many people may not have the financial means to participate in the world of alternative treatments to the degree found in this book. However, it still creates awareness and offers an alternative path for approaching healing and treatment programs for children with CP. The more parents who demand treatments be made available for their children, the more likely it will occur. Just a decade ago it was almost unheard of to have acupuncture covered by insurance but now many policies will cover it because it was working for patients. Unique Me Magazine: A magazine for families with both typically developing children and those with special needs. The Mermaid Chronicles: A blog about life, family and raising a child with cerebral palsy. Maxinne also has a wonderful facebook page. These Broken Vases: Writer Ellen Stumbo details her journey with her three children two of whom have special needs. One of her children has Down syndrome and another has cerebral palsy. Her easy to be with spirit, along with her honesty and humility shine through her writing. Outrageous Fortune: Blog of a former journalist, writer, and mother of twins one of whom has CP. This mom is intelligent, creative, resourceful and humorous. She writes about aspects of interpersonal interactions and life that make me laugh and cry. Love That Max: A heavily awarded “mom blog” about life with her son who has CP, this mom is also a professional writer and has a blog called “To the Max” on Parents.com. I find her posts honest, fun and pertinent. She has a huge following and is privy to lots of good information and resources for special needs parents. Bringing the Sunshine: Journey with this mom who has a daughter with CP and a son with Down Syndrome. Little Bill episode called Monty’s Roar-an episode of the children’s show Little Bill where he meets and befriends a little boy with CP. My Left Foot: A great film base on a book by the same title. This is the story of Christy Brown who was born with cerebral palsy in Ireland in 1932. He was the 1oth of 22 children and though his parents were urged to place him in a convalescent hospital, they decided to raise him at home (a rare choice for parents in those days). He had debilitating spasticity throughout his body but was able to use his left foot which he relied upon heavily to accomplish most tasks. Despite the odds against him, he became a painter and novelist using his foot for both activities. The movie debunks many myths about the individual with cerebral palsy including the assumption that he/she is not intelligent. I found this movie uplifting, yet also painful as you watch the character struggle through the most simple tasks. But Christy’s humor, resilience, and intelligence inspires rather than leaving the audience despondent. Although the ending alludes to a happy conclusion, family reports have surfaced depicting a less than favorable picture of Christy’s marriage to Mary Carr. Lives Worth Living: A wonderful documentary of the ADA that aired on public television. “Dan Keplinger was born with severe cerebral palsy. But at 30, he’s already a successful artist, the subject of an Oscar-winning film called King Gimp, and he’s finishing his second college degree. NPR’s Neda Ulaby visited Keplinger at his home near Baltimore, Md., and reports that the artist continues to gain critical acclaim — and continues to challenge the limits his disability puts on his own body”. Excerpt taken from NPR and is by Neda Ulaby. My name is Dr Darrell Pone a physician with cerebral palsy. I admire the list of books written especially the one about Fathers by Don Meyer. I have also written book. Since retiring I spend most of my time speaking to Groups of children and parents sharing the love and patience I received from my Mother, the late Annette Pone. I also speak about marriage to my lovely wife Gloria. The title of my book: We’ve come this far by faith; Dr Pone’s ten keys to Success. Hello Dr. Pone! Thank you for your message and making me aware of your book. I will be sure to check it out! My name is Brian Wright and I was born with mild cerebral palsy called “Spastic Hemiparesis”. The title of my book is: “Living Beyond Shadows”. 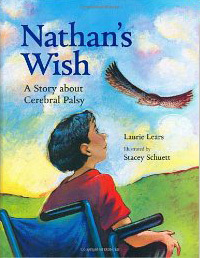 My book can be an inspiration for individuals who suffer with cerebral palsy. Despite numerous setbacks and hardships that many individuals go through, with disabilities in life, we can overcome trials and tribulations just by believing in ones’ self and to never give up despite adversity. si mauro, l’ho letto anche io quel commento, e che potevo rispondere? b’rat Ã¨ inigeelltngibile, Ã¨ come ascoltare Capezzone del PDL o Paniz, oppure Quagliariello, sono gtotteschi nel girare le frittate e alla fine Ã¨ solo aria fritta o commenti molti oleosi. My experience with processing grief is that it often happens in stages, and that — especially when there is a sense of having lost the usual sense of control, and perhaps more importantly, continuity — the process involves confronting and overcoming anxiety and resentment as well. Sometimes I wonder what impact brain injury and PTSD have contributed to that process for me — whether they have made it easier or more difficult in some respects, and/or whether the [acicmpanyong] re-learning process provides new insights and developments that facilitate coping.